California State University, Northridge communication studies professor Bernardo Attias encountered the Confederate flag and the rhetoric and symbols of white supremacy. Photo by Lee Choo. Professor Attias opened his Rhetoric of Peace and Conflict course to the public Sept. 12 for a special lecture topic. Photo by Lee Choo. 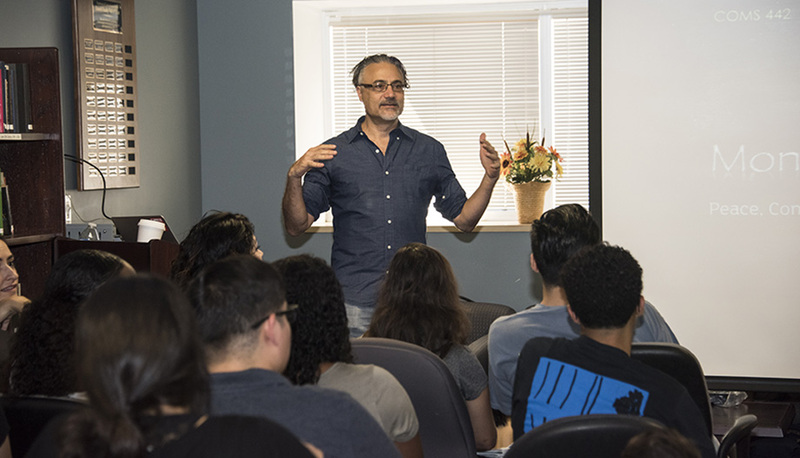 While growing up in north Miami Beach, Fla., in the 1980s, California State University, Northridge communication studies professor Bernardo Attias encountered the Confederate flag and the rhetoric and symbols of white supremacy. As a boy, he said, he didn’t understand the divisive and violent history of those symbols. Does social change require protests, or does it demand a revolution or violence? Those were the questions on the minds of his students this month, the professor said. 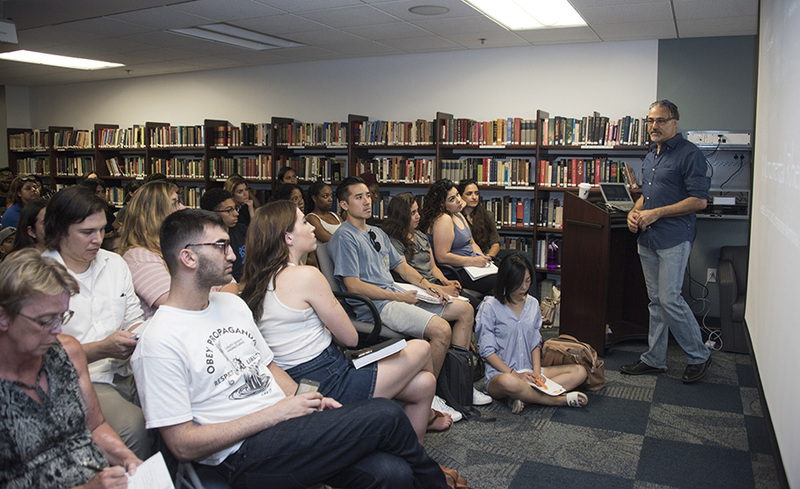 In response to protests across the nation and the recent violence around Confederate statues at the University of Virginia in Charlottesville, Attias opened his Rhetoric of Peace and Conflict course to the public Sept. 12 for a special lecture topic. The lecture, Teaching in these Difficult and Divisive Times, was held at the Aronstam Library in Manzanita Hall and drew approximately 200 students. Attias focused much of his lecture on the resurgence of interest in Civil War monuments — especially those enshrining the Confederacy — and their place in United States society. “I don’t normally research this topic, but the Charlottesville incident provoked me to visit this question due to my more personal connection to the topic,” he told the audience. In his research, Attias found that there are more than 1,500 symbols of the Confederacy cross the U.S. that were federally funded, according to the Southern Poverty Law Center. He cited one statue of Robert E. Lee located in Charlottesville, Va., that was built in 1924, decades after the Civil War ended. That time period (the 1920s) coincided with the rise of the Ku Klux Klan and increasing fear of the loss of white supremacy, he said. Attias also pointed out that there has been a continuous resurgence of building these statues. In 1998, for example, white nationalist Jack Kershaw designed a statue of Nathan Bedford Forrest, a Confederate general, and the monument was erected in Memphis, Tenn.
A new social movement to take down or rename these structures is gaining momentum, Attias said. The lecture, one in a series, was sponsored by the Department of Communication Studies. Journalism student Blanca Palacios, who attended the lecture, said what she learned about the number of Confederate statues still standing was disheartening. Attias also went into detail about schools and parks that are named after Confederate leaders, and petitions to rename these public institutions. He noted the example of a school in Long Beach, Calif., renamed in 2016 from Robert E. Lee to Olivia Herrera Elementary, after the founder of Centro Shalom who passed away in 2002. Centro Shalom provides assistance to poverty-stricken neighborhoods in the Long Beach area. Attias also showed news clips of President Donald Trump talking about the events at Charlottesville, a VICE news reporter interviewing a white supremacist and visuals of statues being pulled down by protesters. During the lecture, participants raised the topic of controversial speakers coming to college campuses. Attias recommended that in those cases, students divert attention by creating an event on campus to bring students together. Attias closed the lecture by discussing the appropriate rhetoric to look at Civil War monuments and fostering open discussion. He said that reframing the debate pulls the rug out from under white suprematists, whereas fighting them directly (especially in a violent manner) gives them exactly the attention they want and feeds their image of themselves as oppressed.